Easy Chicken Stir Fry Noodles is the perfect recipe for busy weeknights. Best of all, this dish is simple to customize with any leftover protein and vegetables. Quick and simple stir-fries and noodles are our favorite things to make during the week. They come together in less than 30 minutes and are great for using up ingredients you have in your fridge and pantry. With spring just around the corner, I am extremely excited to have more options of fresh produce to cook with. 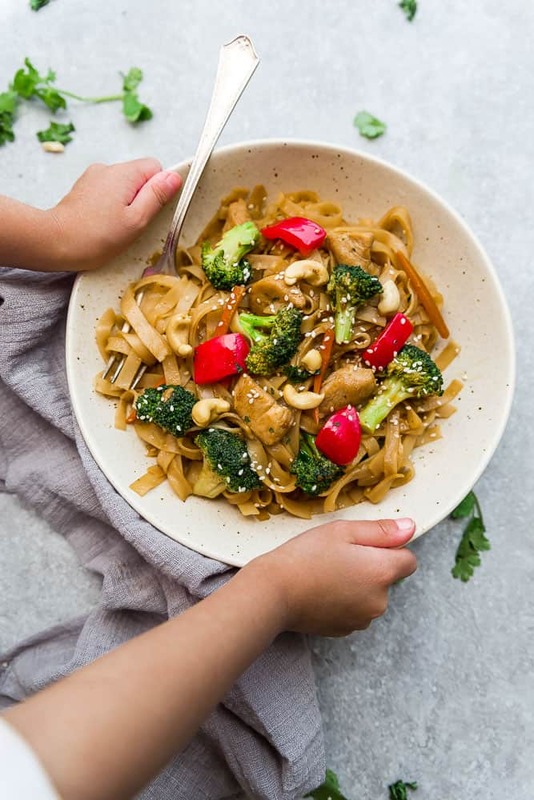 These Chicken Stir Fry Noodles are packed with a ton of spring vegetables and bursting with flavor thanks to the help of Soy Vay®. Their high quality sauces and marinades come in a variety of delicious and unexpected flavor combinations. I love that they are so versatile and contain no preservatives. We are all about easy and flavorful meals around here and these sauces make it easy to create impressive meals with less effort. You’re going to start off by soaking the rice noodles in a big bowl of hot water. 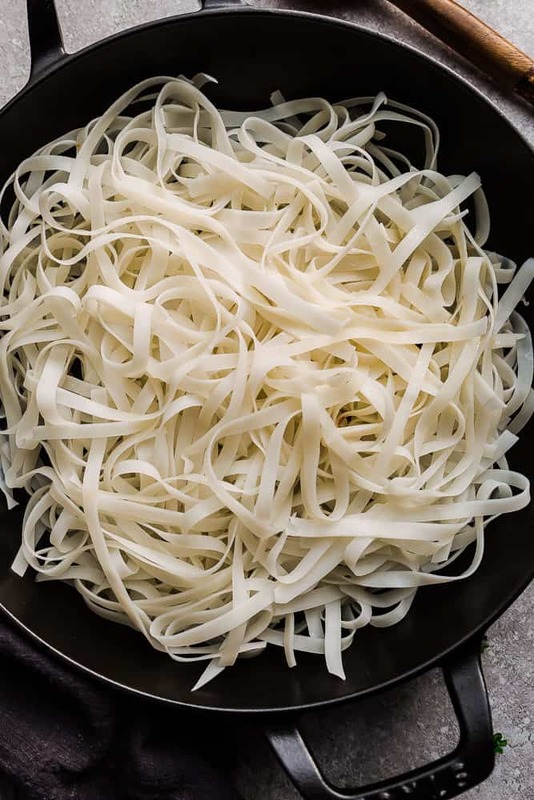 The great thing about rice noodles is that they are gluten free and are ready in about 8 minutes. The ones I used for this recipe are about 1/4″ thick like you would find in Pad Thai or Pho. You can usually find them in the Asian aisle at most large grocery stores. Next, you’re going to brown the chicken over medium-high heat in a large wok or skillet then transfer to a plate. Saute the ginger, garlic and vegetables until they are just crisp tender. All that’s left to do is toss everything up in the pan until coated and heated through. 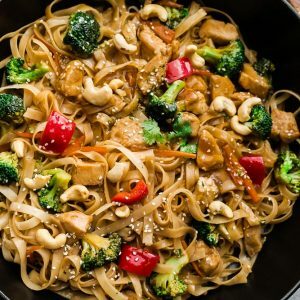 Serve hot with some roasted cashews along with a sprinkle of sesame seeds and you’ve got a mouthwatering dish for National Sauce Month or any spring occasion! 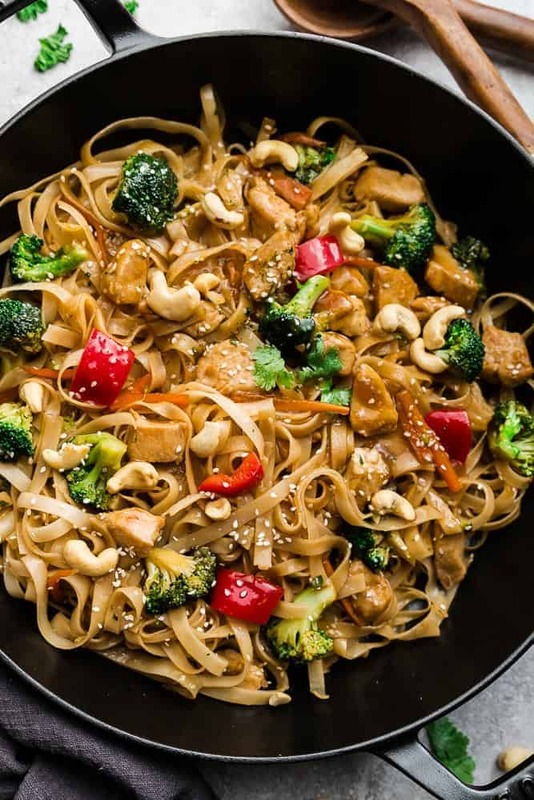 Chicken Stir Fry Noodles is the perfect easy recipe for busy weeknights. Best of all, this dish is simple to customize with any leftover protein and vegetables. Heat a large wok or skillet over medium-high heat. Add 1 1/2 tablespoons olive oil and saute chicken until cooked through about 4-5 minutes. Transfer to a plate. Return pan to heat and add remaining olive oil. Add the garlic, ginger, broccoli, and grated carrots. Cook until the vegetables are just crisp tender, about 2-3 minutes. 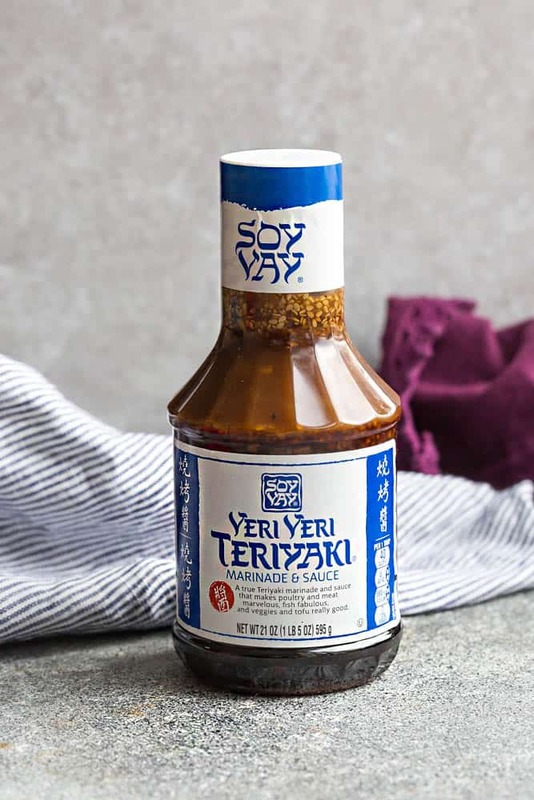 Meanwhile, whisk together the Soy Vay® Veri Veri Teryiaki® sauce, cornstarch, orange juice, and chili garlic paste. Stir into the pan along with the cooked chicken and prepared noodles. Allow sauce to bubble and thicken up and toss to coat well. Adjust seasonings with salt and pepper as needed. Serve hot topped with sesame seeds, if desired. Thisbrecipe looks delicious! I’m just wondering hownmuch Soy Vey Teriyaki sause to use.